I discussed photon momentum in a recent article (The Pioneer Anomaly, December 19, 2012). De Broglie conjectured that this equation was also true for bodies with mass. We just need to replace p with the particle momentum, mv, where m is the mass, and v is the velocity. Such a simple result can be explained on a single page. This, however, was just a part of de Broglie's Ph.D. thèse, "Recherches sur la théorie des quanta," so the thèse was of "standard" size, a little more than a hundred pages. According to a letter written by the duc de Broglie in 1886, "The title of Prince of the Holy Roman Empire was given by the Empress Marie Theresa to the Maréchal de Broglie in 1759, to be worn by him and all his male descendent's." This idea that matter has a wave nature was proved in an experiment on electron diffraction by Clinton Davisson and Lester Germer at Bell Labs in 1927. De Broglie was awarded the 1929 Nobel Prize in Physics "for his discovery of the wave nature of electrons." Davisson shared the 1937 Nobel Prize in Physics for the discovery of electron diffraction, but Germer was notably slighted. Clocks are made from frequency sources. The best clocks are atomic clocks based on electron transitions in atoms of elements such as cesium and rubidium. Since the momentum of massive particles is much larger than that of photons, even when they are moving at low velocity, the wavelengths of matter are very small. Since frequency f is expressed in terms of the wavelength and the speed of light c as f = c/λ, the corresponding frequencies are very large, and it would appear that a "matter clock" would be outside the realm of today's technology. The twin paradox is a narrative way of expressing the idea that time passes differently for a moving and stationary object; or, when objects are placed at different locations in a gravitational field. The time difference is called time dilation. As I wrote in a previous article (General Relativity Test, October 7, 2010), this effect has been verified by the slowing of atomic clocks in aircraft,[3-4] and even by just having one clock placed a little higher than the other on Earth's surface. [5-6] The clocks in GPS satellites need to correct for this effect. The Berkeley work is a continuation of atomic interferometry experiments that have been pursued for several years. An earlier experiment used two matter waves of cesium atoms at 3 x 1025 hertz, separated vertically by a 100 micrometers, to create a measurable interference pattern. It's all done with mirrors - Many, many mirrors! 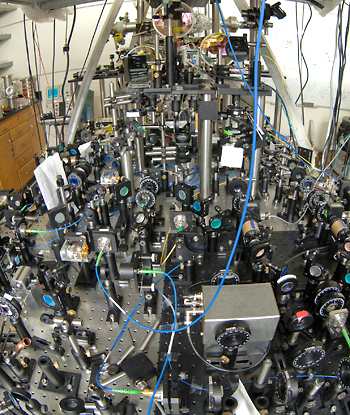 The optics on this optical table prepare light beams from six lasers to capture cold atoms in a matter interferometer. The Berkeley matter clock is called a Compton clock because it is based on the Compton frequency of atoms, f = mc2/h, which can be derived from the de Broglie wavelength. The matter wave clock is possible only because the interference of two cesium matter waves produces a measurable beat frequency of about 100 kHz. [8-9] The measurement is done by synchronizing a laser beam with the cesium atom beam using an optical frequency comb. The accuracy of this first matter wave clock is about one second in eight years, or a hundred million times less accurate than the best atomic clocks. [8-9] However, one might use the analogy that the matter clock is at the pendulum clock point in its history, and its working its way up the chronometer hierarchy. This unusual clock has engendered some controversy. Vladan Vuletic, Division Head of Atomic, Biological, Condensed Matter and Plasma Physics at MIT, is quoted in Science News as saying, "I think the paper is slightly oversold." Also, there's a conceptual problem that there really isn't anything that's oscillating. This matter wave clock is further proposed as a mass standard, since you can determine an atom's mass by its frequency. [7-8] At this point, my money is on the Watt balance, instead. Louis-Victor de Broglie, "Recherches sur la théorie des Quanta," University of Paris, 1924 (PDF File). Letter of Elise Willing Balch, The Magazine of American History with Notes and Queries, John Austin Stevens, Benjamin Franklin DeCosta, Henry Phelps Johnston, Martha Joanna Lamb, Nathan Gillett Pond and William Abbatt, Eds., vol. 15 (March 1, 1886), pp. 407-408. J. C. Hafele and Richard E. Keating, "Around-the-World Atomic Clocks: Predicted Relativistic Time Gains," Science, vol. 177, no. 4044 (July 14, 1972), pp. 166-168. J. C. Hafele and Richard E. Keating, "Around-the-World Atomic Clocks: Observed Relativistic Time Gains," Science, vol. 177, no. 4044 (July 14, 1972), pp. 168-170. C. W. Chou, D. B. Hume, T. Rosenband, D. J. Wineland, "Optical Clocks and Relativity," Science, vol. 329, no. 5999 (September 22, 2010), pp. 1630-1633. C.-W. Chou, D. B. Hume, J. C. J. Koelemeij, D. J. Wineland and T. Rosenband, "Frequency Comparison of Two High-Accuracy Al+ Optical Clocks," ArXiv Preprint (February 2, 2010. Shau-Yu Lan, Pei-Chen Kuan, Brian Estey, Damon English, Justin M. Brown, Michael A. Hohensee and Holger Müller, "A Clock Directly Linking Time to a Particle's Mass," Science, Early Online Publication, DOI:10.1126/science.1230767. Robert Sanders, "A rock is a clock: physicist uses matter to tell time," University of California, Berkeley, Press Release, January 10, 2013. Andrew Grant, "New clock revolves around an atom's mass," Science News, January 10, 2013. Robert Sanders, "Most precise test yet of Einstein's gravitational redshift," University of California, Berkeley, Press Release, February 17, 2010. Linked Keywords: History of quantum mechanics; quantum mechanics; Louis de Broglie; Doctor of Philosophy; Ph.D.; thèse; Hermann Minkowski; Max Abraham; vacuum wavelength; photon; Planck constant; Plank's constant; momentum; conjecture; equation; mass; velocity; Louis de Broglie; Wikimedia Commons; matter has a wave nature; experiment on electron diffraction; Clinton Davisson; Lester Germer; Bell Labs; Nobel Prize in Physics; wave nature of electrons; clock; oscillation; frequency source; atomic clock; electron transition; atom; chemical element; cesium; rubidium; speed of light; technology; Holger Müller; University of California, Berkeley; theory of relativity; relativistic; twin paradox; narrative; time; gravitational field; time dilation; Earth; GPS satellite; atomic interferometry; experiment; hertz; micrometer; interference pattern; mirror; optics; optical table; laser; Damon English; Arthur Compton; Compton frequency; beat frequency; hertz; kHz; synchronization; synchronizing; optical frequency comb; analogy; pendulum clock; chronometer; hierarchy; Vladan Vuletic; Massachusetts Institute of Technology; MIT; Science News; oscillation; oscillating; International System of Units; mass standard; Watt balance; Louis-Victor de Broglie, "Recherches sur la théorie des Quanta," University of Paris, 1924.